Unlike many professional artists who turn to full-time art from teaching or other careers, David has always worked within the professional art and graphic arts industry. He was one of Britain's last Litho Artist apprentices in the days of the 'closed shop' and the Society of Lithographic Artists, Designers and Engravers. 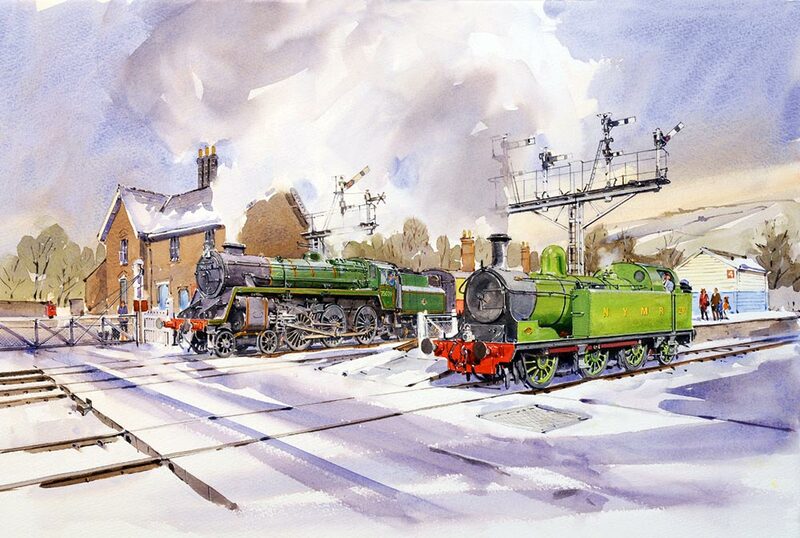 He began drawing trains and aircraft before he was three years old, started painting with oils when eight and completed his first commission when only twelve! Born in 1954, he is one of the few professional artists of his years with almost 40 years continuous experience producing and selling paintings and illustrations for customers at home and abroad. The Batasia Loop is a spiral railway created to ease the gradient on the Darjeeling Himalayan Railway. At this point, the track spirals around over itself through a tunnel and over a hilltop. 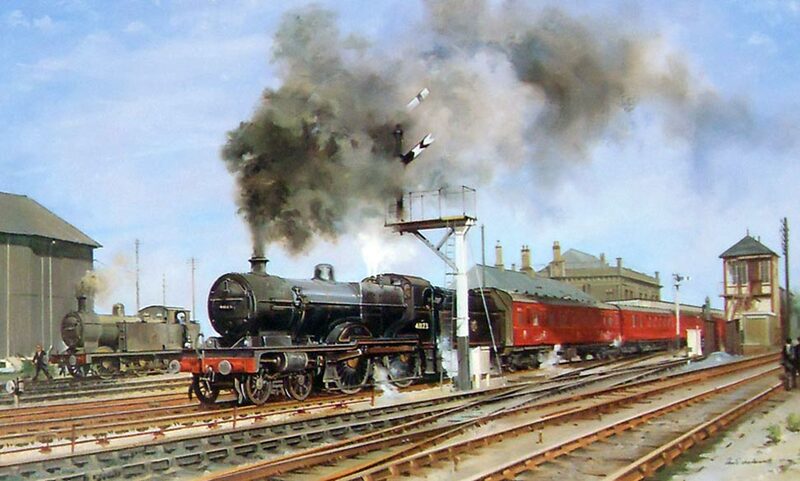 The Midland Railway station in Chesterfield with a Midland Railway 4-4-0 compound locomotive heading a south-bound local. English Electric class 20 diesels. British Railways standard class 4 4-6-0 leaves Grosmont Station on the North Yorkshire Moors railway. Horns bridge on the Great Central Railway Chesterfield Loop. On the middle level, seen in this view, was the Midland main line and Brampton loop line. On the upper level was the Lancashire Derbyshire and East Coast Railway Lincoln line. A B class locomotive on the Darjeeling Himalayan Railway climbing through the streets of Kurseong half-way from Siliguri to Darjeeling. The famous locomotive seen in 1951 at a famous location. The inside of Nottingham Victoria was cathedral-like. Closed and demolished in 1967, it had served the city for only 70 years. It's loss is still mourned today. A Standard 9F, with a Windcutter freight, so called because of the incredibly efficient out-and-home runs by performed by the GC drivers, on these loose-couple coal trains. This entire area is now a housing estate. Dunford Bridge end of the Woodhead Tunnel.